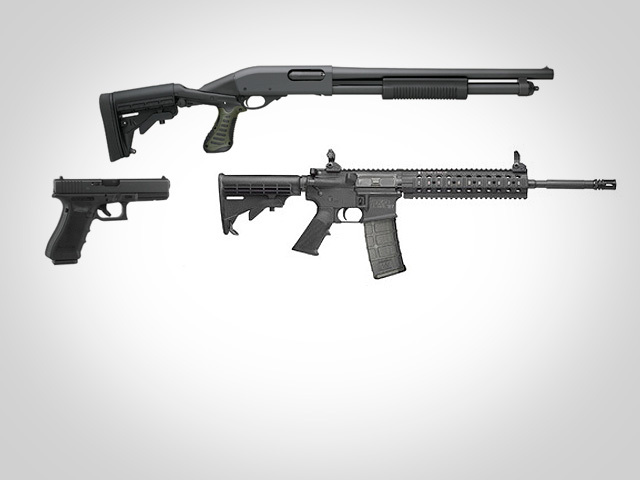 (CBS News) More information about the firearms used in the deadly shooting in Aurora, Colo. during the midnight "Dark Knight Rises" screening has come to light. A law enforcement source close to the investigation told CBS News that all the guns were purchased within the last six months, which is considered a "short time to the crime." The guns were all purchased legally between May 22 and July 6 at three Colorado gun stores. James Holmes purchased a Smith and Wesson .223 semi-automatic rifle at Gander Mountain gun store in Thornton, Colo., according to the law enforcement source. He also bought a .40 caliber Glock pistol at Gander Mountain gun store in Aurora, Colo. Another .40 caliber Glock handgun and a Remington 870 shotgun were purchased at Bass Pro Shops in Denver, Colo. Wearing full body armor and wearing a gas mask, Holmes allegedly entered the Century 16 theater through a fire exit and threw two gas canisters into the audience. He then opened fire on the audience, hitting 79 people. At least 12 are dead and 59 more are wounded. The semi-automatic rifle, shotgun and one of the pistols was used during the massacre. Bass Pro Shops offered their "deepest sympathies" to the victims and their families in a statement to CBS News. "This is an unspeakable tragedy, and we join with all Americans in offering our prayerful support," Larry Whiteley, Manager of Bass Pro Shops Communications, at Springfield, Mo. corporate headquarters, said. "Based on the records we have reviewed, personnel in our Denver store correctly and fully followed all federal requirements with respect to the sale of one shotgun and one handgun to the individual identified in this incident. Background checks, as required by federal law, were properly conducted, and he was approved. Again, our hearts go out to the victims and their families. We also offer our support and appreciation to the law enforcement and emergency response professionals and all others who responded to give aid to these innocent victims." The other chain store, Gander Mountain, also offered their condolences. "Gander Mountain fully cooperates with law enforcement in criminal investigations like the one regarding the tragic events in Colorado," Jess Myers, media and public relations specialist, told CBS News in a statement. "We operate in strict compliance with all local, state, and federal laws regarding firearms ownership and are fully cooperating with this on-going investigation. As long-time business owners in Aurora, this community is our home and the home to many of our associates and customers. We send our thoughts and prayers out to those affected. In respect for the victims of this tragic crime and their families, we will have no further comment in this matter." Federal law requires licensed firearm dealers to alert authorities of repeat gun purchases only when a buyer purchases two handguns from the same dealer within five days. Other multiple gun purchases do not require notification of law enforcement. Aurora police chief Daniel Oates had previously confirmed that Holmes was found with an AR-15 assault rifle, Remington shotgun and .40 caliber Glock handgun. A second .40 caliber handgun was found in his car. Editor's note: This article has been updated to correct references to the .223 caliber semi-automatic rifle and Remington 870 shotgun.